The big holiday in China is the Spring Festival 春节 Chūn jié which is widely known elsewhere as Chinese New Year. It is far more significant and a longer break than Christmas in Christian countries. It is observed not only throughout China but everywhere there is a significant Chinese community ➚ or influence including Singapore, Taiwan, San Francisco, Manila, Toronto, Kolkata, New York, Vietnam, Malaysia and Korea. Japan has similar traditions but now celebrates them in the first week in January. Like Easter, Chinese New Year is a movable feast, it falls on the second new moon after the winter solstice on December 21st, making it fall between the end of January and mid February (for details see our Chinese calendar page) . Each New Year has an associated astrological animal and anyone born in the year is considered to take on some of its attributes; for more on pigs; rats; dogs; dragons; tigers; goats; roosters; snakes; horses; oxen; rabbits and monkeys please see our Astrology section. As well as celebrating the first signs of the beginning of spring it celebrates everybody’s birthday because in China you reckon you are one year older at the Spring Festival rather than on the anniversary of your birth. There are very many associated traditions that vary over the country especially when it comes to festival food (for all about Chinese food see our food page). It is a big family get-together like Thanksgiving and Christmas and in China this reaches immense proportions; so many people travel on planes and trains that they are all chock-a-block making it the largest mass migration of people on Earth (about 4 million people travel by train each day of the holiday). The exodus is called 拜年 bàinián ‘New Year visit’. Getting everything ready for the Spring Festival requires a good deal of effort. Bonuses are often paid so everyone has some spare cash to spend on presents and decorations. The extra cash is also handy to settle any debts before the end of the year - it is traditional to start the year with a clean slate. On the 23rd or 24th day of the previous month an offering is made to the Kitchen god 灶君 Zào jūn (aka. 灶神 Zào shén). Every house has its own shrine or at least a poster to this important folk deity, it is said that before New Year he makes a report on the household’s activities during the year to the Jade Emperor (Daoist supreme god). To ensure it makes a positive report the kitchen god is offered various sweet treats including thick treacle so its mouth is stuck firmly shut and it is unable to make a bad report, but if he is able to report it will naturally be all sweetness! On the 28th the house is swept and cleaned. Bamboo brooms are considered the best for symbolically sweeping away evil. It is unlucky to use or even see a broom during the festival - it is regarded to symbolize the sweeping away the luck. The last few days of the old year are spent putting up decorations, preparing food, buying and wrapping presents. It’s not just mum who is locked in the kitchen it is traditional for all the family to help (or try to help). Everybody has a long bath, puts on new, smart clothes and has a haircut to smarten up for the big day. It is unlucky to wash clothes on the 1st or 2nd day of the New Year – all housework is on hold for a while. The house must be prepared for the holiday. Many decorations are colored red as that is the lucky color. ‘Spring Scrolls’ and ‘Door Guards’ are some of the most common. Spring Scrolls 对联 duì lián are big character posters that are pasted either side of the door, the inscription wishes good luck and joy, often something like ‘Peace will reign each day’ or ‘Wealth increases each year’. There are books full of such couplets and range from the metaphorical to the obtuse. The scrolls are usually black or gold characters on red paper and reflect a very ancient custom when sheep's blood was used to smear the two sides of the doorway. Above the door may be another phrase such as 五福临门 wǔ fú lín mén ‘May the five blessings come home’. Door guards are figures of fierce, ancient warriors who guarded the Emperor, poster representations are put up to keep out evil; these date back at least as far as Emperor Taizong of the Tang dynasty (over 1,400 years ago). A new couplet for the new year. Shennong Street, Tainan, Taiwan. Image by Oliver515 ➚ available under a Creative Commons License ➚. Couplets are either side of the door and over the lintel. Paper-cuts are displayed in the window panes. New Year pictures and posters 年画 nián huà are also widely available in many forms, traditionally these are very intricate, colorful hand-printed designs. ‘The Mouse’s Wedding’ is a popular scene. Cleverly made paper-cuts are also popular and displayed on windows. A welcome sight are boughs of plum or peach blossom in southern China, often on display in houses and shops. It is one of the first flowers of the year and its delicate pink flowers appear before the leaves. The character for good fortune 福 fú is widely seen and often displayed upside down. This is to suggest that good fortune is to come down from heaven - see our page dedicated to Fu for an explanation. Fu is also the name of the god of Good fortune, a member of the trinity of Fu, Lu and Shou (fortune, success and long life). Tangerines, satsumas and other types of orange are very popular as in the Cantonese language 橘 jú is pronounced the same as ‘fu’ and so means good fortune - as well as being colored lucky red. Many red lanterns, sweetmeats and a profusion of decorations are available at fairs held before the big day. Temples often run the stalls making the Spring Festival an important source of income. The family gathers together for a lavish meal (the reunion meal: 团年 tuán nián)on the evening before the Spring Festival made up of a dozen or so dishes. The lavish spread of food implies that there has been a surplus in the closing year. The meal will usually include fish, because the Chinese for fish is 鱼 yú which sounds the same as 余 yú ‘plenty, surplus’. 饺子 Jiǎo zis (similar to ravioli but in soy not tomato sauce) are a popular New Year Eve dish in northern China. Jiaozis are popular because they are shaped like silver/golden boats or 元宝 yuán bǎo which were used as high value currency and also because it sounds like the phrase ‘change of time’ in Chinese – they are often eaten on the stroke of midnight. The normal filling is minced beef and cabbage with ginger and spring onions. Sometimes a coin is hidden inside a jiaozi giving special luck to the recipient. In the south Niangao rice cakes are more often eaten instead, here gao ‘cake’ sounds the same as ‘on high, tall’ so 年糕 nián gāo is taken to mean ‘higher year after year’. Offerings are made to the ancestors often at a little shrine within the home. Special ghost money (specially printed in large denominations from the Bank of Hell) may be burned. During the afternoon 辞年 cí nián ‘farewell year’ ceremonies take place. Many sit up until midnight to see the New Year in (守岁 shǒu suì ‘guarding the year’) ; these days normally watching a lavish and lengthy TV gala. It’s likely that a cacophony of firecrackers and rockets will wake everyone up at midnight anyway. The Spring Festival is mentioned in inscriptions on oracle bones from as early as the Shang dynasty – so that's 3,500 years. The most widely known legend about Chinese New Year is that in ancient times villagers were menaced by a vicious monster called 年 Nián that came each year to devour their children and livestock. After many years of terrorizing the village it was found that loud noises, bright light and people dressed in red frightened the Nian monster away; and so to this day people cover their houses in red and let off loud firecrackers. The legend of the Kitchen (hearth) legend is that he found that the world was in such a mess that he went to petition the Jade Emperor to destroy humanity. The other gods pleaded for them to be spared and so the Jade Emperor decided to let the gods visit Earth and see for themselves. During this time people had stopped work so they could clean and set everything neat and tidy for the visitation and so mercy was shown. In dynastic China all formal business, including the criminal system, came to a halt because the official seals needed to formally 'sign' all legal documents were locked up for the duration of the holiday. The formal part of the festival in Imperial China took place at the Temple of Heaven, Beijing where the Emperor performed solemn rituals to seek heaven's blessing for the New Year. It was also traditional to go to your boss's house and give them a present, in return for which the boss would lay on a meal and entertainment. Early on New Year's Day is the time to have ears blasted with numerous firecrackers 爆竹 bào zhú; but firecrackers are now regarded as such a noise and pollution nuisance that they are banned from the center of large cities. Many cities now put on impressive communal firework displays to welcome in the year. In the morning of the Spring Festival children greet their parents and grandparents. In olden days children would kowtow to them. It’s considered unlucky to wake up anybody on that day - so everyone can enjoy a relaxing lie-in. The wish for a ‘Happy New Year’ is 新年快乐 xīn nián kuài lè ‘new year soon happy’ and also 年年有余 nián nián yǒu yú ‘year after year bring abundance’. In return the children are given a monetary gift in a 红包 hóng bāo lucky red envelope ➚ this is called 压岁钱 yā suì qián 'lucky money'. The traditional greeting for business colleagues is 恭喜发财 gōng xǐ fā cái ‘congratulations, become wealthy’ or the familiar ‘gong hei fat choy’ in Cantonese. Much food is of course consumed, in the north this will usually be meat but in the south this is often vegetarian fare - after all a big feast has already been eaten on the previous night! This comes from the Buddhist tradition of 罗汉全斋 luó hàn quán zhāi where a dish of 18 vegetarian dishes is considered lucky. Lion and dragon dances take place in most cities and Chinatowns overseas. These are often accompanied by parades of drummers making yet more noise to scare the Nian monster away. Everyone is expected to be on their best behavior for the whole holiday so that New Year starts on a harmonious footing so complaints and swearing are off limits – after all it is considered everyone’s birthday. Fairs are held to offer all sorts of tempting gifts and foods particularly aimed at children. Goldfish are common gifts as both ‘red’ and ‘fish’ are symbolically lucky. Entertainment in the form of opera, acrobatic displays, theater and gambling are widely seen. There are numerous customs relating to gifts that apply all year as well as this festival, for example giving pears or gifts made up of ‘fours’. Some are specific to the festival for example not writing your signature in red ink and fish should not be turned over when eating them. All sharp objects should be hidden away to avoid ‘cutting the luck’. 1st day: Visit the older, senior members of the family. Sweets are often given in groups of eight as 8 is a lucky number. 2nd and/or 3rd day: Visit to the in-laws family. Traditionally when a woman married she lost frequent contact with her own family and was adopted as a full member of her husband’s family. These two days offer a rare occasion to visit her family together with her husband and children. Gifts often include candy, dried fruits and nuts. The 2nd day is also the day to give your family dog a treat as it is considered its birthday. If someone in the close family died in the last three years the third day is devoted to honoring their memory. Some businesses will start up again on the 3rd day. 5th: The God of Fortune (财神 Cái shén) has his birthday and so traditionally windows and doors are left open to let him visit the house. 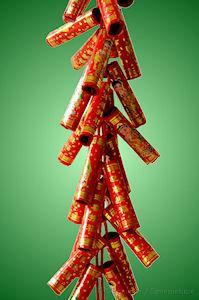 It is also another day when many firecrackers are let off to welcome the good fortune for the year ahead. Most people are back at work by this day. 6th: In a reverse of the previous day of welcome, now is the day to send the God of Poverty packing. In some regions symbolic carts and boats are decorated and food placed on them (rice and potatoes) to encourage him to leave. 7th: Is regarded by some as the anniversary of the creation of mankind by Nuwa from yellow clay. 9th: A celebration of the birthday of the supreme Daoist god the Jade Emperor, so a Daoist temple may be visited. Some also celebrate the 8th day as the Eve of his birthday. 13th: Is a day to refrain from all the eating of meat and eat healthily as well as celebrate Guan Yu the God of success. The official public holiday is typically a whole week but some will use annual leave to make it a longer break - particularly if they have traveled long distances to be with family whereas people working in shops and restaurants will not have much of a break at all. The Lantern Festival marks the very end of the holiday, it occurs on the next full moon after Chinese New Year and so falls on the 15th day. However most people are already back at work. There is a full description of that along with all other Chinese festivals on our festivals page. Citation information for this page : Chinasage, 'Chinese New Year or Spring Festival', last updated 21 Dec 2017, Web, http://www.chinasage.info/chinesenewyear.htm.